The economic integration of refugees is a multidimensional process. Yet, existing research predominantly assesses economic integration unidimensionally as rapid employment or as wage level. Few researchers examine refugees’ long-term prospects for earning a livable wage. I argue that to understand refugee economic integration researchers should model multiple dimensions. Using a combination of administrative data and regional contextual data, I employ event history analysis to compare models predicting employment to those predicting the acquisition of a livable wage. I find that the factors contributing to employment differ dramatically from those that contribute to earning a livable wage. The study offers strong support for the broad hypothesis that scholars need to theorize the causes of different forms of economic integration separately. Bloch, A. (2004). Labour market participation and conditions of employment: A comparison of minority ethnic groups and refugees in Britain. Sociological Research Online, 9(2), 1–19. https://doi.org/10.5153/sro.919. Glasmeier, A. K. (2012). Living wage calculation for Salt Lake County, Utah. livingwage.mit.edu. http://livingwage.mit.edu/counties/49035. Accessed 9 Dec 2012. Hayden, M. E. (2017). US civil rights groups worry anti-Muslim sentiment is fueling right-wing extremism. ABC News. https://abcnews.go.com/US/us-civil-rights-groups-worry-anti-muslim-sentiment/story?id=47840271. Accessed 4 August 2018. Jardine, S. (2015). Refugee Assistance: Issue Brief. Salt Lake City, Utah: Utah State Legislature, Office of the Legislative Fiscal Analyst. Retrieved https://le.utah.gov/interim/2015/pdf/00005565.pdf). Accessed 4 Feb 2019. Nibbs, F. (2016). 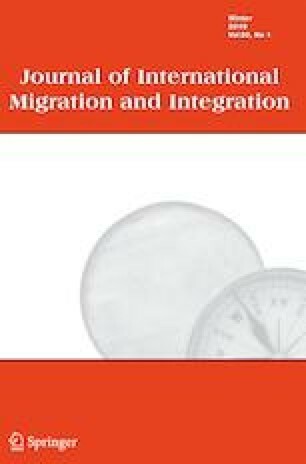 Moving into the fastlane: Understanding refugee upward mobility in the context of resettlement (pp. 1–56). Arlington: Forced Migration Upward Mobility Project http://www.fmump.org/. Accessed 4 Aug 2018. Portes, A., & Stepick, A. (2007). Unwelcome immigrants: the labor market experiences of 1980 (Mariel) Cuban and Haitian refugees in South Florida. American Sociological Review, 50(4), 493–514. https://doi.org/10.2307/2095435. Refugee Services Office, Utah Department of Workforce Services. (2019). About the Refugee Services Office. Retrieved February 4, 2019 (https://jobs.utah.gov/refugee/about/index.html). Rose, J. (2017). Trump administration to drop refugee cap to 45,000, Lowest In Years. https://www.npr.org/2017/09/27/554046980/trump-administration-to-drop-refugee-cap-to-45-000-lowest-in-years. Accessed 4 Aug 2018. Wike, R., Stokes, B., & Simmons, K. (2016). Europeans fear wave of refugees will mean more terrorism, fewer jobs. Pew Research Center. http://assets.pewresearch.org/wp-content/uploads/sites/2/2016/07/14095942/Pew-Research-Center-EU-Refugees-and-National-Identity-Report-FINAL-July-11-2016.pdf. Accessed 20 Feb 2018.